→What Is A Scramble In Golf? Golf is a game of exhilarating highs and crushing lows. It doesn’t matter if you are a weekend warrior, or Tiger Woods: every once in a while you are going to find yourself staring down a putt for triple bogey. Sometimes, you will even have the pleasure of watching it slip out. For as truly, transcendently wonderful as the game can be, there is nevertheless no shame in sometimes wishing you’d saved your money, and slept in instead. After all, you work hard for your cash, and time is certainly something that most of us don’t have to spare, so why spend it frustrated, right? Well, if you are looking for a little bit of relief from the discouragement, or you just want the satisfaction of holding a scorecard with your name, and a 65 on it, we might have an answer for you. The scramble. The “scramble,” is a format that requires 2-4 players to team up and plays around under a loose set of rules where the fun is the emphasis. Since “the scramble,” is not officially covered by the rules of golf, guidelines will vary tournament to tournament and group to group, but there are several general consistencies that you can count on. A “scramble” round will start the same as any other. Everyone in your group will hit from the tee box, using the club of their choice, after which point, you as a group will determine which ball achieved the best results. “Best” can mean longest, or it can simply mean that one player’s shot has a good angle towards the flag. Whatever the case, once your group has decided which shot was best, everyone will go to that spot, and hit from there, continuing in that fashion until the hole, and then the round is complete. Tournament play will often see the addition of more rules issued with fun and timeliness in mind. Many tournaments will offer groups a set limit of “mulligans,” allowing them to re-hit shots that did not go their way the first time, while other tournaments will feature a two-putt rule, in which no group is allowed to take more than two putts on a given green. 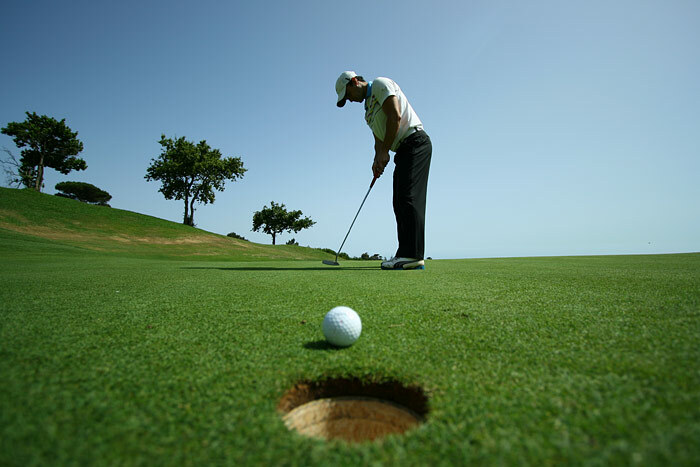 Rules such as that maintain a swift pace of play, and allow golfers the opportunity to relax, and just have fun. If you are a purist, the idea of a scramble may seem silly, or even obscene, but keep in mind that for many people, it is their only opportunity to shoot a decent score. The scramble format takes the pressure off individual shots and allows players who normally can’t break 100 the opportunity to be the hero and sink the par-saving putt that earns their team the hardware. It’s a great equalizer in a sport that is notoriously unforgiving. No, it may not be quite as satisfying as stringing a few good holes together with the traditional way, but considering how many players spend more time in the woods than the fairway, I think it is a trade-off many people will be willing to make. Like we said, the scramble is a loose format. Even in tournaments, most of the time the majority of players are there to drink beer and enjoy a few stress-free hours on the links. That being the case, here are few suggestions for how you can maximize your fun while playing in a scramble. If you are playing in a foursome, you can pretty much count on at least one person hitting the fairway on any given hole. While it can be a little nerve racking when the pressure is on you to be that person, when it isn’t, there is a certain pleasure in winding up like John Daly to try and crank one three hundred yards deep. I’m sure there is a litany of shots you’ve seen done on TV that you would never try throughout the course of a round where every stroke counts. But in a scramble, there is no need to worry about making a tough spot worse. Whether you want to try and flop it like Phil Mickelson or hit a hundred-yard hook that lands softly on the green like Bubba Watson, the scramble gives you the freedom to hit shots you used to only dream about. You don’t need a scratch golfer to make the most out of a scramble round, but it certainly helps. Having one player on your squad that hits it three hundred, or has no trouble tucking one close into a tight pin is a great opportunity to vicariously live the life of a par golfer, at least for the duration of the round. If you’re the sort of player that breaks out their thick copy of the rulebook every time they want to move a twig that’s near their ball, the loose format of the scramble probably will not be for you. For everyone else, the scramble is a great way to spice up your weekend round. Kick back, open a beer, and get ready to shoot the best round of your life with your buddies.